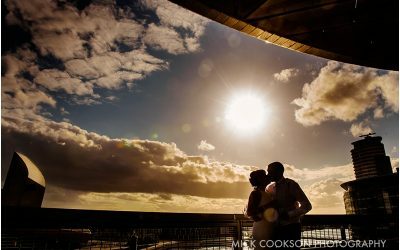 Revisited – Alex & James’ brilliant wedding at The Lowry . 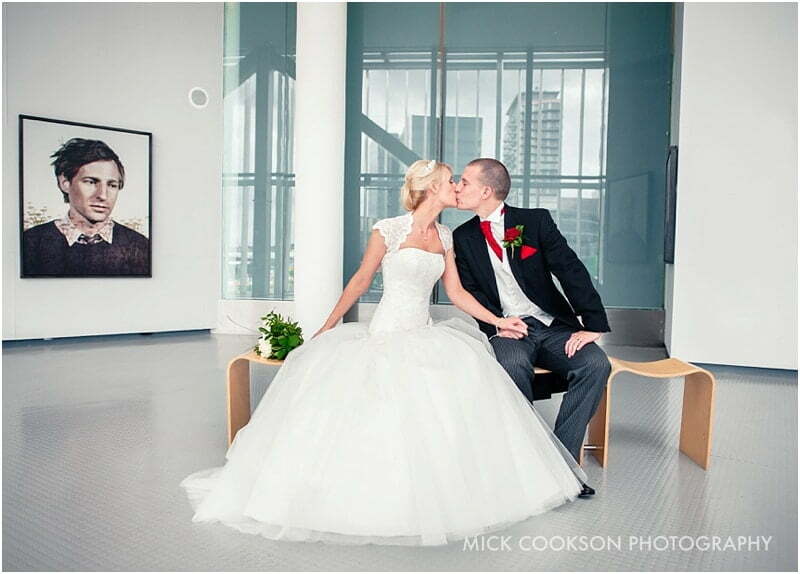 The couple asked me to produce their Lowry Theatre Wedding Photography, and it’s a total no-brainer. How could I refuse? I love working at The Lowry. 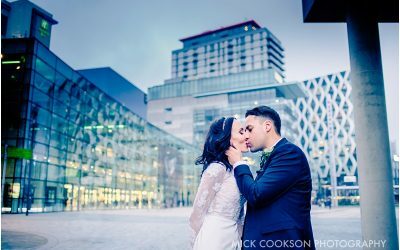 A totally unique wedding venue, and being primarily a Manchester Wedding Photographer, I really enjoy photographing urban, funky weddings. I met Alex and her girls at a nearby hotel, where they were getting ready. The church was to be Our Lady & The Apostles in Stockport, which limited my time with the girls somewhat – but we had a plan, and everything was running like clockwork. Alex arrived bang on time too, and escorted by proud dad, seemingly ‘floated’ down the aisle towards a slightly nervous-looking James. The Priest was brilliant – he gave me free reign to shoot where and what I needed to. Thanks! Unusually for me, I used a 70-200mm lens on one of the Nikons. The light was good, and this setup gave me lots of scope for good images. One of the guests couldn’t make the wedding, being based overseas. So, he donned a wedding suit to match the groomsmen and sent a life-sized photo cutout of himself to be at the reception…and the group shots…yes, see if you can spot him…. Up into the Compass Room for the wedding breakfast and speeches. As the newlyweds entered the room, the blinds lowered in synch as they walked around. Clever and very effective! Not to be outdone, the good lady herself stood up and gave a brilliant, funny and heartfelt speech! 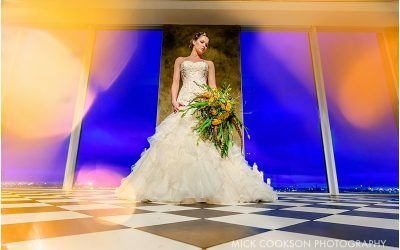 The Compass Room is an amazing part of the venue, with almost 360 degrees panaromic views, and looks stunning at sunset, as the light fades and the DJ lighting starts to take over.